Source: My mother-in-law about 1990’s. 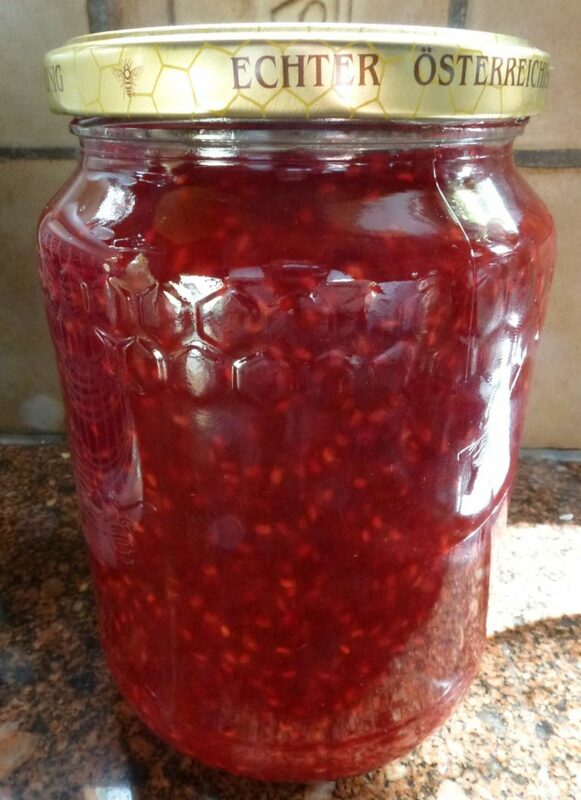 My mom and I have been making jellies and spreads for years now-with having a nice sizey organic orchard, we had the benefits of having bushels of ripe fruit at once. It was always a 2-3 hour labor intensive process, but the outcome was always worth it and well received by the family. However, this post is about the ease of making a quick batch of fresh fruit jelly. It was the thanks to my mother in law who introduced me to this quick and easy process for making as little as 1, or up to 6 jars at a time-with out the intensity of working on big batches. It roughly translates to a pound of fruit, a pound of sugar = 6 jars of jelly. Our lovely little garden has an abundance of established raspberry bushes. Every year, they multiply and die out, thus providing nice, healthy shoots for Spring. In the height of summer, every morning we go out and pick from the vines-sometimes it takes a few days to get 4 cups of fruit, while other times, like today, I got it in one picking. This recipe is great for those small batches of jelly and jam. It takes a few minutes to prepare, and total job time is about 15 min. This recipe is great for those small batches of jelly and jam. It takes a few minutes to prepare, and total job time is about 15 min. The kids love this fresh jelly/jam, and we do too! Take your fresh picked fruit, wash it, drain it and put in a pot-large enough to give your fruit room to expand and cook with out bubbling and splashing you. Cook the fruit on high for about 5-10 min. Add the sugar, and the lemon juice. Cook and stir for 10 min. Get a fresh clean jar, have more than less ready in case you need them. Add your pectin, stir with a whisk for 3-5 min. Pour into clean, sanitized jelly jars. Close and let stand until the lid is sealed (in cooling process) Store in cool dark place, or refrigerate.